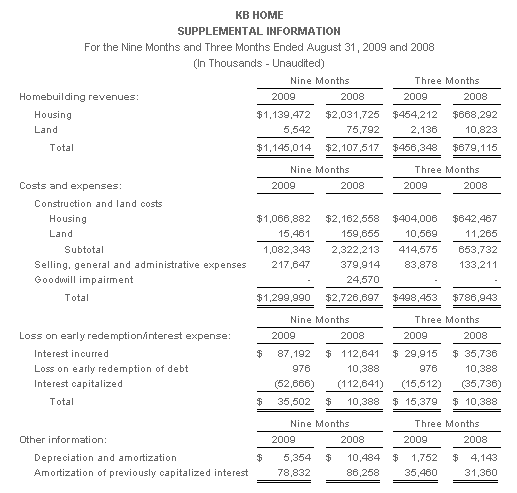 Home builder KB Homes (NYSE:KBH) today reported financial results for its 3Q ended August 31, 2009. The California based builder, which sells built-to-order homes in 10 states, said it lost $66 million during the quarter, or $0.87 per share, which was $0.29 worse than consensus that called for a loss of $0.58 per share. Revenues totaled $458.5 million, down 33% from $681.6 million – y/y basis, due to lower housing revenues. Third quarter housing revenues were $454.2 million, down 32% from $668.3 million in the year-earlier quarter. The company said its backlog at the end of the 2009 third quarter decreased 22% to 3,722 homes from 4,774 homes at the end of 3Q08. Meanwhile, the average selling price fell 15% y/y to $202,800 from $239,700. In the nine-month period ended August 31, 2009, the builder’s revenues totaled $1.15 billion, down 46% from $2.11 billion in the year-earlier period. 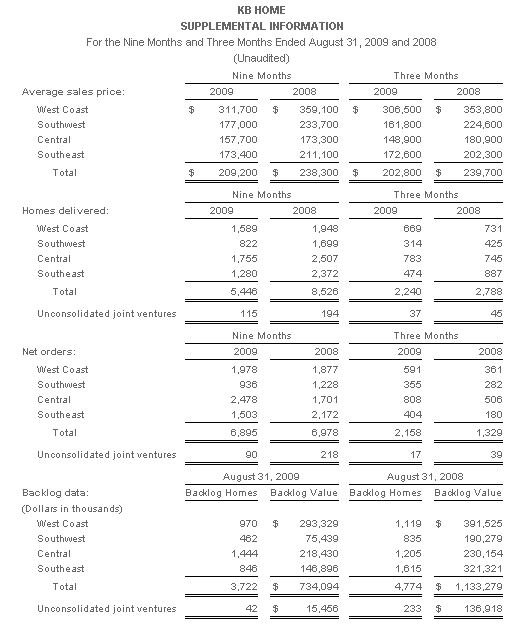 KB Home has reported a loss for nine consecutive quarters, going back to its fiscal 2Q in 2007.